← A tiny red sun with a sky full of planets! As I pointed out yesterday, the recently announced TRAPPIST-1 system is tiny. The little star itself is barely larger than Jupiter. But what about the system as a whole? So I made a model. Behold! This image shows all sizes to scale with each other and all distances to scale with each other, but not sizes to scale with distances (I’ve reduced the distances by 10x). It’s easier to display that way. You can see a larger version by clicking here, if you like. So here are a few interesting things which you can pick out. 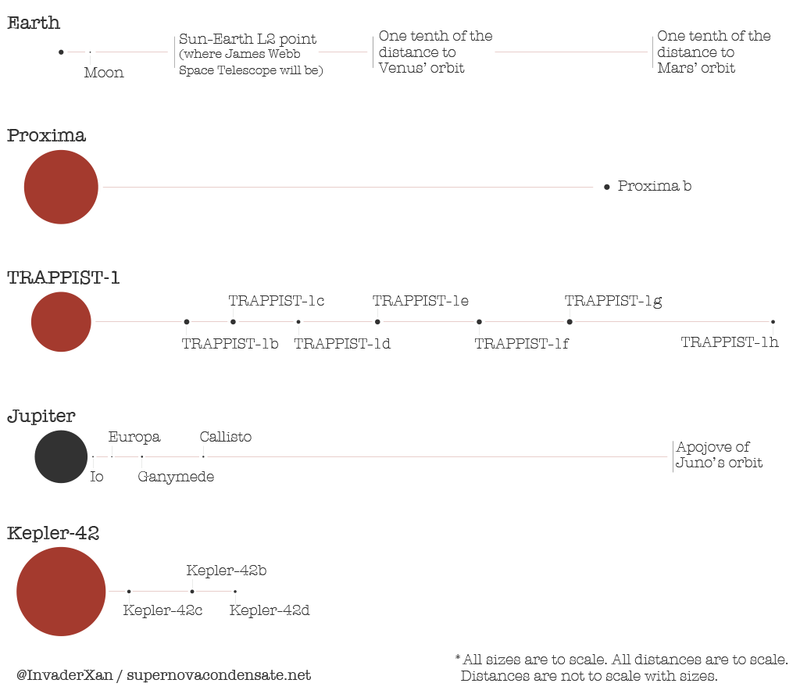 The TRAPPIST-1 system is a similar size to the Proxima system. It’s a lot larger than the Kepler-42 system which is, to my knowledge, one of the most compact star systems we know of. It’s also about 3 times as large as the main Jupiter system, where Juno is currently doing its thing – but I also marked Juno’s apojove. This is the furthest point in Juno’s orbit around Jupiter. Turns out, a similar orbit around TRAPPIST-1 would give a great view of the whole star system! If anyone does live on any of the TRAPPIST-1 planets, I must say I envy them. Exploring the rest of their solar system would be easy compared to the task we have here in ours. Incidentally, I did make an image with everything to scale, and you can see it if you click here. Needless to say, trying to display that on this website was… not feasible. This entry was posted in astronomy, space and tagged graphic design, planets, stars. Bookmark the permalink.